Shooting Fox Sports Signage @ 2am in St Louis. 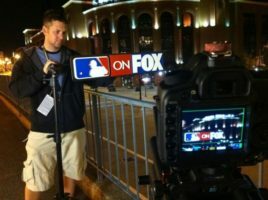 This year I was lucky enough to go on the road with Fox Sports for their coverage of the ALCS and World Series. The MLB Postseason this year was filled with some amazing moments in sports history, but the month of October also proved to be one of the most challenging assignments I’ve worked on thus far. Grabbing the opening shot of the Pregame Show for Game 1 in Texas. 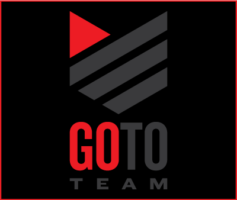 I got started in early October as the MLB Divisional Playoffs began by traveling to Yankee Stadium in New York to capture the Yankees taking on the Detroit Tigers. It actually ended up becoming The Yankees/Tigers v. the Rain, as almost every game faced either rain delays or was cancelled all together, presenting what would be the ongoing challenge of the month – staying dry. Needless to say we put our rain gear through the paces this season. (I also picked up a wicked cold this first week that carried itself into the month of November, which I of course blamed on my sound guy the whole trip even though he wasn’t with me the first week of travel). After NY we traveled to each game back and forth between cities. The Tigers ended up shutting down the Yankees late in the series, sending us to Texas to begin shooting with the Rangers for the Texas v. Detroit Series, which eventually turned into St Louis v Texas for the World Series. I forgot how many baseball games I attended this October but it was somewhere in the range of 20. 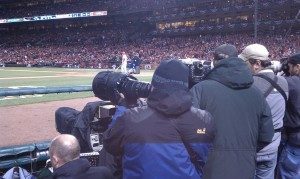 And on top of everything we were shooting we also had another Go To Team crew, Dan Lowrey, out shooting other Postseason games all throughout October. Dan has got a whole other story to tell about what he got into, so I’ll let him tell it himself in another post. Some of the footage I shot during game time would often be used by the game broadcast crew for the game rollout – the last highlight montage shown during the closing of the game broadcast. I was shooting most of our footage on 5D/7D package, which meant we had h264 files on a CF card that we needed to run back to the edit trucks between each inning. Those files then had to be ingested, transcoded and organized for the editors who were cutting together bumpers on-the-fly. The end product was worth the work though. The combination of the 7D’s size and smooth slow-mo capability made it the perfect fit for working in the small camera wells, which is something like standing packed in a sardine can on a shaky platform with glass lenses and camera bodies as the only cushion between you and the next person. I saw several people drop items that were still on the ground hours later since there was no room to bend over and pick them up without knocking over the next guy….sort of a cameraman’s soap-on-a-rope policy if you will. After a historic 7 Game series the St Louis Cardinals came out on top of the Texas Rangers, clenching the 2011 World Series. Can’t wait for postseason 2012 – I’ve got a few tricks up my sleeve for it already. We’re back in Atlanta for now, resting and re-energizing for the next shoot/adventure later in the month.